You know what’s awesome? The fact that there are SO many places these days that sell affordable workout apparel. I remember the days when finding good, cute and affordable workout clothes was a chore. But now, well, they’re on almost every street corner. You young’uns don’t know how good you have it! But, no, seriously, finding affordable workout clothes is super easy. And here are seven places we love to shop at for them! 1. JCPenney. Have you seen JCPenney’s new Xersion line? Talk about affordable! Even the normal prices for basics like capris and tanks are reasonable ($20 to $40), but they regularly run sales that make some of the items dirt cheap. We were sent a few pieces from the Xersion line (jacket, capris and a tee), and we were pretty impressed. They’re not uber performance or luxurious, but they certainly get the job done — and they’re cute. Heck to the yeah! 2. Old Navy. Besides the fact that I can’t go into an Old Navy this time of year without coming out with no fewer than five pairs of flip flops (all the colors! ), nobody beats Old Navy Active when it comes to affordable workout apparel. From basics to prints to comfy yet fit-looking stuff to lounge in, the normal prices are generally around or less than $20, and like JCPenney, they’re almost always running a deal or have stuff on clearance. 3. Target. We’ve loooong been fans of the C9 line at Target and with good reason. The gear is wallet-friendly, full of bright colors and has dang quality for the price. Erin, Tish, Kristen and I all swear by the sports bras and the socks — read our full review here! 4. Academy Sports. I’m not exactly sure how Academy Sports does it, but they do. If you want name-brand gear for less, this is your spot. They run pretty ridiculous deals on Nike, adidas, Under Armour and all of the big names you love. Kind of like a T.J.Maxx, but for fitness! 5. Kohl’s. Erin loves Kohl’s so much that she wrote a whole post about it. They’ve got pretty much any item you’d want — pants, capris, tanks, Ts, sports bras, socks, shoes — and it’s all affordable. Kohl’s changes out its options pretty often, too, so there’s almost always a new deal to score! 7. Fabletics. Nobody does affordable like Fabletics. Owned by Kate Hudson, this online store is part shopping and part personal shopper. To get started you take a quick quiz, Fabletics suggests an outfit for you, and then you get to shopping. And your first outfit is only $25 — for the WHOLE OUTFIT! Try it here. The online marketplace Zozi has great deals too- they sell name brand stuff for the same prices you’d find in stores but if you scour the sale section you can get some great deals!! I found a cute hoodie for after my workouts at H&M — not normally a place I’d shop, but it’s adorable and really comfy so I may have to go back and check out their tanks next! I am pretty shocked to not see Cory Vines (www.coryvines.com) on this list. I’ve been their biggest fan for a while now and they’re pieces are very affordable! Finding good workout gear in plus sizes is always hard. Do these places have clothes for us too? Lots of great new and used fitness clothes here: http://stores.ebay.com/Best-Deals-On-Clothes-and-Plushes Nike, Under Armour, Adidas, Reebok, and more 🙂 Free shipping too! Although I’m not a fan overall, I have to say Walmart. I love the Danskin fitness line there. The shorts, t-shirts, yoga pants- you can find a fit AND they last. No TJ Maxx or Marshalls? That is pretty much exclusively where I buy workout clothes. these stores tend to not carry sizes (or at least cute stuff in sizes) for larger women. Where are cute and good fitting workout clothes for the 2x or 3x crowd? Today I bought workout wear from Burlington. Their prices are awesome! I find it odd bigger women lament not being able to find their sizes when as a fit woman, that’s all I find. Go to Walmart – that’s all they carry. TJ Maxx is my go to spot for the clothes, Target for sports bras. Finding the high impact sports bras affordable is difficult. It seems it’s not easily understood that a woman can be a 34 D or DD. Finding that band size less than 38 under $50 is the real trick. TJ Maxx and Marshalls are the best! I buy a lot from Kohls. I also buy from Fabletics and Old Navy. Fabletics, in my opinion, isn’t the cheapest but I can attest to their quality being exceptional! Plus, I do wear most of my Fabletics gear also when not working out so it’s really multifunctional & a great value. I’m also a fan of Xersion. The quality is really good and I have plenty of items from this line that are holding up great through the wear & tear. JCP constantly has awesome sales that you can pair with coupons and their JCP rewards too. You can also find plenty of items in their clearance sections online & in store as well. In addition, Target’s C9 line is great. They always have cute, fashionable items and you can also find plenty of stuff on clearance during most times. TJ Maxx & Ebay are two of my other go-to places. 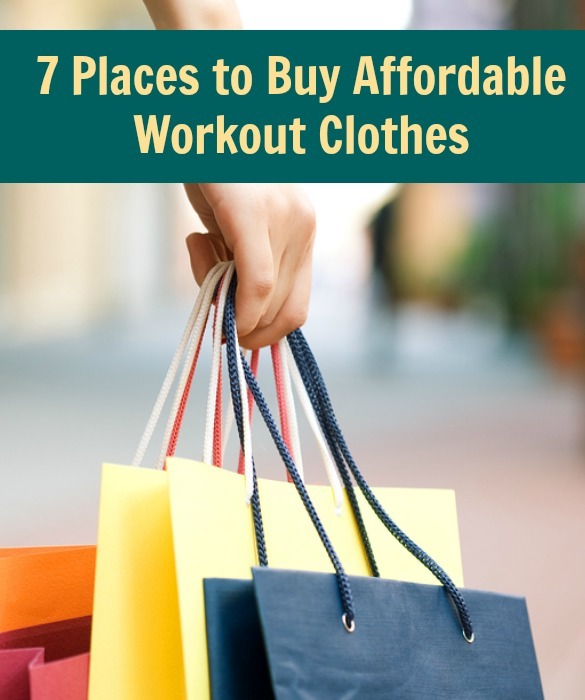 Great list of stores that offer stylish and comfortable workout clothes both for in or out of the gym, my favorites are Old Navy and Fabletics. H&M has amazing workout clothes, I can’t get enough of how well they fit me. They have a plus size line that I envy, some styles are cuter than the normal line. I just wish I could find a place and makes workout pants for petite women as I’m only 5ft 1in.